Millennials are people who were born from the early 1980s to 2000s. 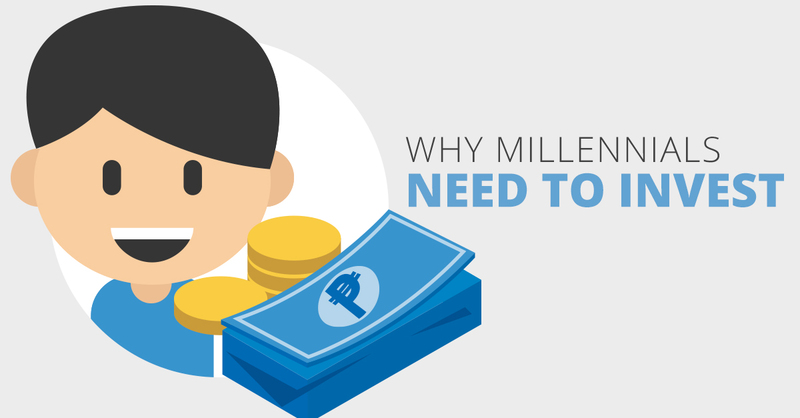 Most millennials these days like spending on tangible things such as houses/condos or cars and focus more on life’s experiences like enrolling to special courses, watching events/concerts or travelling to different countries rather than investing their money in stocks, bonds, UITF or insurance. Even though millennials are tagged as lazy, materialistic and impatient they are known to be open-minded, opinionated and can easily adjust to a fast-paced environment. By educating the millennials and convincing them to put a portion of their money in investments, they will be able to learn the value of wealth creation. 1. Because you deserve a bright future - What are your goals, five to ten years from now? Whether you decide to buy a house, a new car or start your own family, start implementing a savings program that would help you achieve your future goals. 2. Because you deserve a relaxing life - You may be thinking that it’s too early to plan for your retirement. But, taking an action now gives your money more time to grow. 3. Because you deserve a peace of mind - Life is full of uncertainties. Strategic financial planning allows you to face any hurdles that come your way especially when you get ill and hospitalized. You need a hospitalization plan that provides cash allowance to give you time to recuperate and lessen your stress and worries from your expenses . Now, it’s easier for you to achieve a bright future, relaxing life and peace of mind because of this all-in-one product. Paramount Direct’s newest product, Sure Savings Plan, a comprehensive plan that includes Life, Accidental Death and Hospital Income benefits. As a millennial, you need to understand the importance of saving money and what it can do for your future. Start young and get ahead.